There is 60 shades of light brown. 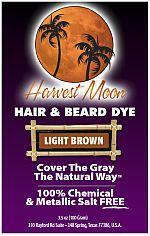 Harvest Moon brown light blends with all light browns. If you have dark brown hair and you want a lighter color, this color is not for you! If your hair is darker brown from henna hair dye, then you will need to lighten it first before using light brown. Please see our lighten your hair in 48 hours naturally page. It is very easy to remove henna this way, however not chemical hair dye. Light brown henna hair dye before and after picture.